Washington, DC & London, UK – February 12, 2019 – The Trustworthy Accountability Group (TAG), an advertising industry organization that fights criminal activity in the digital advertising supply chain, today launched Project Brand Integrity, a new initiative to protect European brands from association with illegal stolen content by alerting advertisers or their agencies to ads running on pirate sites in Europe. Project Brand Integrity will be implemented through a partnership with White Bullet, which will monitor and document ads on infringing sites, so the information can be shared by TAG with the advertiser or its agency. A similar effort has existed in the US since 2016, led by TAG and CreativeFuture, an organization representing creatives in the copyright industries. That effort has successfully reduced the number of impressions on pirate content sites in the US by more than 90 percent over two years, and it has eliminated all ads from premium brand advertisers on those sites. White Bullet, a Digital Advertising Assurance Provider under the TAG Certified Against Piracy Program, will scan the top ad-supported infringing sites serving European markets, identifying any ads from reputable brands appearing on such sites. White Bullet will capture screenshots of both the advertisement and the associated code to reveal all the entities responsible for placing the ad on the site. When a brand has notable ad exposure on infringing sites, White Bullet will notify TAG and provide an evidence package, including screenshots and the advertising code. TAG will privately contact the advertiser and/or its advertising agency and alert them to the ad misplacements, so they can take remedial action. TAG also will educate advertisers/agencies about effective anti-piracy tools to reduce or eliminate future risk, including TAG’s Certified Against Piracy Program. TAG will work with law enforcement partners including the City of London Police Intellectual Property Crime Unit (PIPCU) and with Europol to further raise awareness of the program and support brands and their agencies in their compliance efforts. In addition to the program launch, TAG also released a new white paper, “Winning the Fight Against Ad-Supported Piracy: Successes, Challenges and Best Practices.” Offering a detailed overview of the problem, the white paper outlines best practices for companies and case studies on organizations that are effectively addressing the issue. Those best practices for companies include taking responsibility and communicating your commitment, choosing the right partners, employing the right tools, working closely with partners to develop and execute your strategy, and holding partners accountable. In 2017, TAG commissioned Ernst & Young LLP’s Media & Entertainment Advisory practice to perform a benchmarking study of the US market on piracy. The study found that anti-piracy steps taken by the digital advertising industry have reduced ad revenue for pirate sites by between 48 and 61 percent. Along with many European trade bodies, advertising companies and anti-piracy technology specialists, TAG and White Bullet are both signatories to the European Commission’s Memorandum of Understanding (MoU) on Online Advertising and IPR. Additional information about TAG’s Certified Against Piracy Program and how companies from across the advertising ecosystem can received the TAG Certified Against Piracy Seal can be found at https://www.tagtoday.net/about-certified-against-piracy-program/. 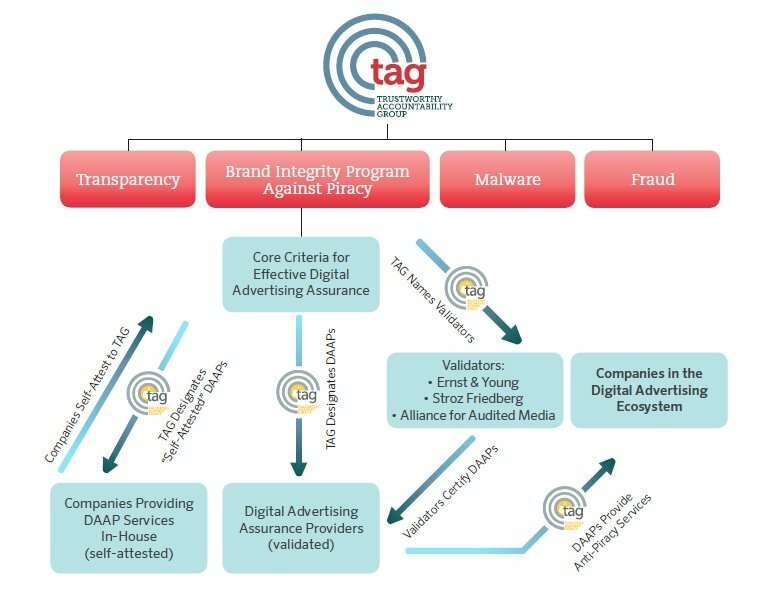 The Trustworthy Accountability Group (TAG) is the leading global certification program fighting criminal activity and increasing trust in the digital advertising industry. Created by the American Association of Advertising Agencies (4A’s), Association of National Advertisers, and Interactive Advertising Bureau, TAG’s mission is to eliminate fraudulent traffic, combat malware, prevent Internet piracy, and promote greater transparency in digital advertising. TAG advances those initiatives by bringing companies across the digital advertising supply chain together to set the highest standards. TAG is the first and only registered Information Sharing and Analysis Organization (ISAO) for the digital advertising industry. For more information on TAG, please visit tagtoday.net.